Protel is one of the leading sources of project intelligence products in Europe. We cover the main process manufacturing sectors in the UK, Ireland, France, Belgium and the Netherlands. If you sell equipment or services to the process industry, our products will definitely help you meet business development goals. Our project sales lead service offers qualified project opportunities. Our team of researchers compiles Bulletins and updates them live when new information surfaces. Upon subscription, you will gain access to our project search engine, MyProtel. This system makes managing sales leads extremely easy because of its powerful customization options. 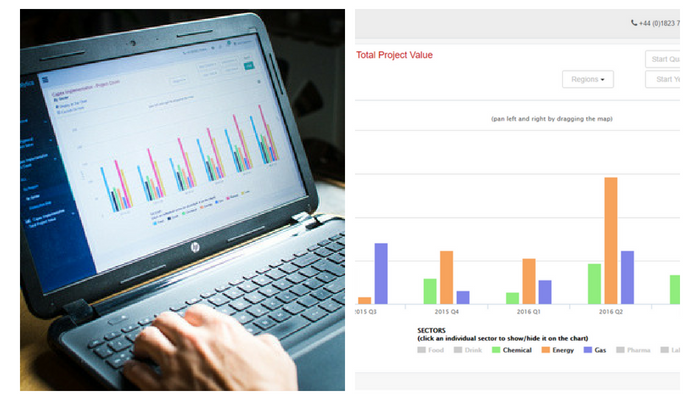 Our analytics system compiles our project sales leads into a graphics and charts, therefore offering visual insight into projects. Get the project data you need to turn insight into sales action with Analytics.